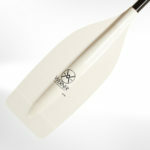 Werner “Luna” model paddles, available with custom cut length. Please allow one day for cutting & glueing w/ special adhesive. $165 This paddle lets you enjoy a powerful stroke when needed. Entry level: Carlisle Economy: black plastic blade on aluminum shaft $31.95 ea. 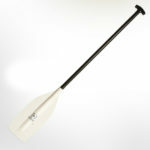 A good starter paddle for white water or general use, available in lengths from 51″, 54″,57″ and 60″. We can show you how to measure length for each person.